Nimitz is probably my first choice. Old blood and guts has to be mentioned. Without these three battle outcomes may have been different. RE: German tanks in the Battle of the Bulge. In this WW2 game I have, that is supposed to be historically accurate, it shows that the German forces at the Battle of the Bulge were made up with around 50 Tiger 2 tanks, 250 Panzer IV tanks, and around 350 (Panzer V) Panther tanks. The Panthers are broken down into Panther D and Panther G. Some 100 other tanks were StuG III, Marders and Jagdpanzers. They also had around 200,000 men but they were mostly Civil Grenadiers and not that experienced. Also check out a book called ““Nuts” - The Battle of the Bulge”, tons of information. “Nuts” was the one word reply from the American commander at Bastogue, direct to the German Commander’s demand for their surrender. In that game when you play as the Allies, it always comes down to the Tiger 2 tanks being difficult to destroy. You have to use bombers to soften them up and stress them out, and then you run around them trying to run them out of fuel so they are stuck. Then you use your M4A3 -76mm Shermans and some M26 tank destroyers to engage head to head, and finish them off. Operation Europe - an older game but quite fun trying the different historical battles scenarios. What did you do in your band? Bassist, background vocals and songwriter. That is absolutely hilarious. You will never guess Brain. I actually love the Priest and Maiden and have a huge collection of CD’s with all kinds of heavy stuff, and, I have been in bands for over 20 years, playing clubs doing covers and I have been in a couple of original progects as well. And I am a bassist vocalist the same as you. I thought we had I few things in common but never realized. I knew you liked Maiden from your previuos Killers icon. Some good responses here - thank you everyone for your imput. I do agree that it is a very good story and the CGI is the best I have seen yet. You do find yourself hoping the Na’Vi come out the winners. The idea of the Avatar that you become and control is also neat. Similar to that Surrogate movie concept with Bruce Willis, where all humans now use “surrogates” to live their lifes through and never go outside themselves. I really liked the floating mountains and the idea that the gravity is different in that area of the planet because of the large gas giant that Pandora orbits. Some thought was really put into this and may actually not be that far fetched. Just was wondering what others thought of the Avatar movie. Just watched it last weekend and was quite impressed. Some top film work in my opinion. I thought that since axis and allies is a strategy game, that people here might be interested in another strategy game… The classic RISK game! This is a really fun online site that has not only the original risk game to play, but also many other different maps and variations to the game as well (one of the countless many being doubles). Along with tournaments and forums, it hosts over 20000 active members in it. Try it out and post your thoughts here! I will give it a try when I can. Jermo this is hilarious, had me wondering until the end when the lightbulb finally went on. The Battleship/Aircraft Carrier hybrid, Ise. Though, I am a fan of most IJN designs. Was this actually built or simply a concept that they were thinking about? Being Canadian I not sure what all the fuss is about. I do not think Canada needs to be seperate in the game. Not sure what these roundels will be used for other then if UK is toast and Canada is now alone then you could use them, if you want these in your house rules. In the World at War 1939 game, Canada does have an IC in Eastern Canada and most games we have played the UK player tends to build ships at that IC because it is better protected being further away. That way German planes / boats do not take out the fleet the round it is purchased. I actually like it. That game does not split the money up and UK can buy and place wherever. In that game Australia also has an IC at the start so UK can buy as it sees fit. UK is not done until at least two of the Capitals fall: either UK / Canada or UK / Australia. Just a thought for those who like house rule changes. I saw this documentary on the Bismark were they found the ship wreck and had the three remaining German sailors that are still alive explain their side of the story and what happened as well as some of the British sailors and their side of the story. That was a very interesting show. The Bismark was at the top and was almost unsinkable. It had some of the largest guns to date on a battleship and it had an inner wall that when a torpedo hit and penetrated the outer hull, huge flow pumps would kick in and fill the “cavity” between the outer and inner walls with sea water so fast that the torpedo would be “stopped” by the water and not allowed to actually detonate on the inner wall and therefore becoming a “dud”. The only reason it was actually sunk was due to a one in a million shot from a topedo plane that actually caught the rudder and jammed it forcing the Bismark into a circle pattern as they could not unjam it. The British fleet moved in and shelled it steady for several hours and it would not sink. 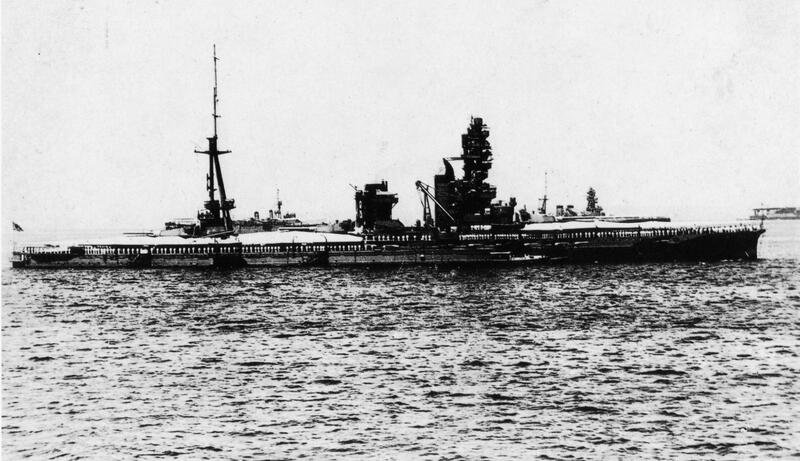 The Germans said they actually scuttlled (sunk) their own ship so as to not fall into enemy hands.